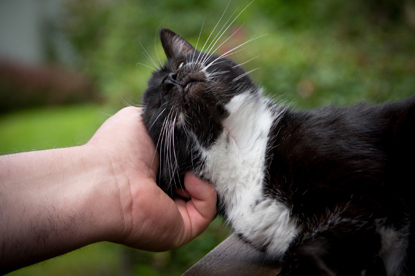 Some cats love a cuddle and will happily let you pick them up, particularly if they have a close bond with you already. However, not all felines favour such close contact. There are many reasons why they could be wary of being touched, including that they have not been properly socialised as a kitten, or that they are in pain. 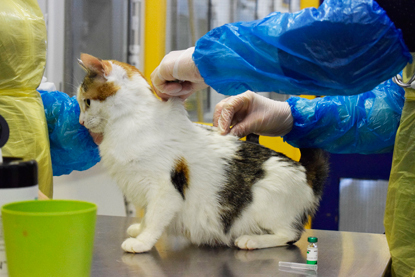 If your cat shows any signs of discomfort with handling, get them checked by a vet first to rule out any medical problems. Whether your cat loves a fuss or not, it’s important to remember that most moggies like to be in control of any human contact they get so it’s best to let them come to you and give them the choice to move away if they want to. Sometimes though, handling your cat is a necessity, such as when it’s time for a visit to the vet or you need to give them some medication. The secret to stress-free handling, for both cat and owner, is to make it a predictable and cooperative process. By giving your cat some warning that you are going to approach them, you will reduce the chance of them becoming scared. For this, it’s helpful to have a special mat or towel that you only bring out for handling training. You can also use a special word or phrase, eg ‘touch’, that you say before each time you handle your cat, to prepare them for what comes next. In fact, to make the training more amusing for yourself, you could even pick whichever word you like as your cat will only hear the sound, not understand the meaning. Pineapple, spatula, tambourine…whatever takes your fancy, just make sure you stick to the same word throughout. To begin training, pick a moment when your cat is feeling relaxed and in a familiar, safe environment with no distractions. Then set your training mat/towel out on the floor and sit at your cat’s level with a small pot of treats beside you. 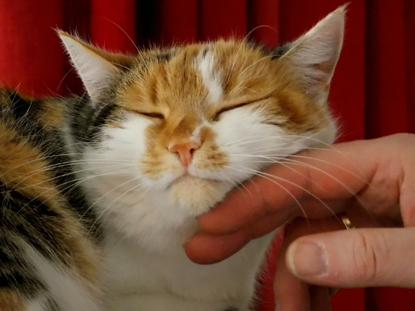 If your cat approaches and is calm (preferably standing still or sitting) say your chosen word, eg ‘touch’, and then move your hand to touch the cat in an area they like being touched, eg the side of the neck, for one second. To build a strong positive association to being touched, give them a treat directly afterwards. If your cat is comfortable with the handling, repeat steps one and two during short sessions that last a maximum of two minutes. Once your cat is comfortable with this, start moving your hand towards an area the cat is less comfortable with being touched. For example, move your hand from the side of the neck to the back of the neck. Again, repeat this process during short sessions that last a maximum of two minutes. When they are comfortable with this, you can then start to build up the duration of the handling from one second each time to two or three seconds. Once your cat is comfortable with this, you can then move the training session to different environments, eg on the table to prepare them for vet visits. Remember to keep using the training mat/towel. When you next take your cat to the vet, take the mat/towel with you and explain to your vet what you have been doing so they can work with you to hopefully make the check up a stress-free experience for everyone. If, during training, your cat does indicate that they are uncomfortable, it means that you have moved too quickly and should go back a step. Make sure your moggy always has the option to move away throughout the training, never restrain them. This training is only for cats who have a good bond with their owner but are uncomfortable with some areas of handling. It is not suitable for fearful cats that hide away from humans or show aggression towards them. In these instances, you should contact a qualified behaviourist for advice.